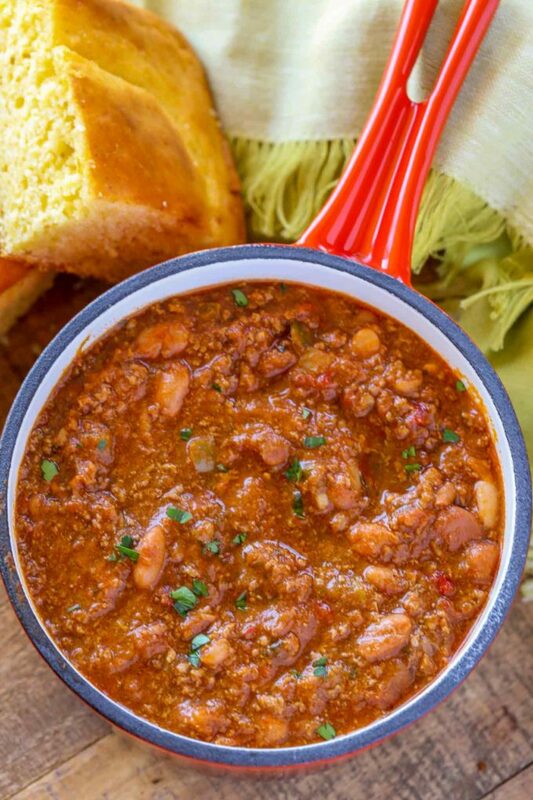 Easy Turkey Chili made with kidney beans, canned chili peppers and plenty of warm spices for the perfect filling Healthy chili! 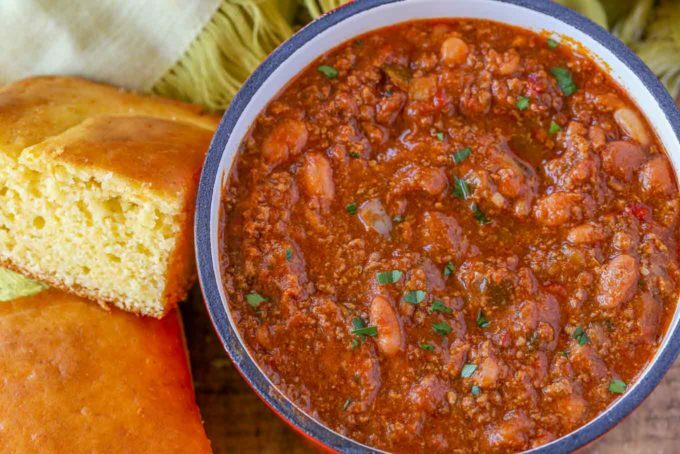 This is the best turkey chili you’ll eat, I promise. It’s easy, hearty, and flavorful. I am not even going to pretend to hide my excitement about this chili. You’ll love this chili and find yourself craving it. I’ve used it in so many ways it’s become a natural filler meal for me. 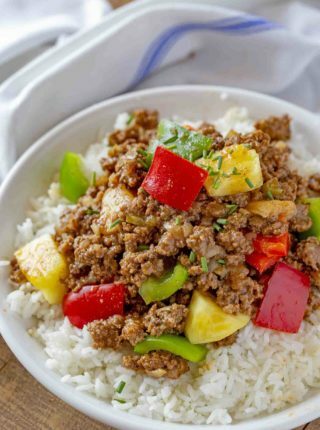 I love making this chili with ground turkey breast. 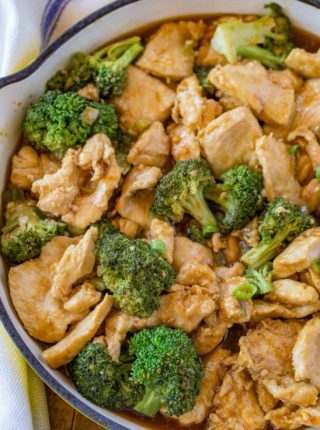 You can certainly use ground chicken breast which is also point free or just skip it altogether. 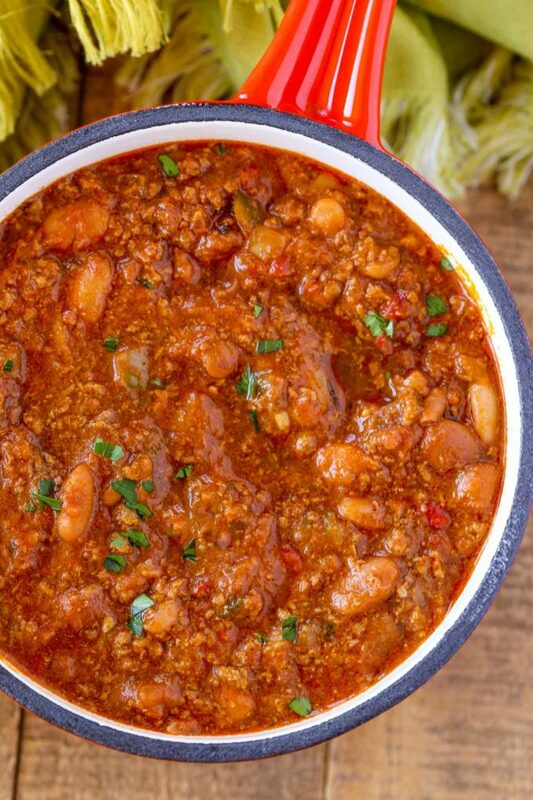 I also make this into a skinny beef chili by using 94% extra lean ground beef which only comes to 2 smart points per serving with 1 1/3 pounds and six servings. Make sure you brown your turkey well, this adds lots of flavor. Cook the onions well before adding in the rest of the ingredients, they’ll melt into the chili. Don’t be afraid of the spices, especially the chili powder. If you prefer an even heartier chili add more beans. Just be sure to increase the spices accordingly. Cook the turkey in the instant pot on the browning setting before adding in the rest of the ingredients (skip the chicken broth) to the instant pot. Cook on high pressure for 8 minutes before letting it naturally come back to regular pressure. Cook the turkey in a skillet before adding it to the slow cooker. Add the ingredients to the slow cooker (minus 1 cup of the broth) and cook on low for 5-6 hours. Top low point hot dogs with turkey chili and shredded extra sharp cheddar cheese on top for an indulgent meal that only feels indulgent. Add 1/4 cup to the middle of bread and sliced super sharp cheddar for a delicious and filling grilled cheese sandwich. Serve over zucchini noodles for a healthier “Cincinnati Chili” copycat. I sometimes do half zoodles and half pasta. Top a salad with it along with tomatoes, fat free sour cream, diced tomatoes and olives. Top a baked potato with chili for a hearty meal with fat free greek yogurt or sour cream. In a large bowl, with a piece of indulgent cornbread (hey your chili is ZERO smart points!). Add the canola oil to a large stock pot on medium high heat with the turkey breast and cook all the way through for 5-7 minutes, breaking it apart with a spatula. Add in the onion, bell pepper and celery cooking and additional 5 minutes while stirring occaisonally. Add in the garlic, kidney beans, diced tomatoes, chicken broth, diced chilis, chili powder, cumin, kosher salt and black pepper. 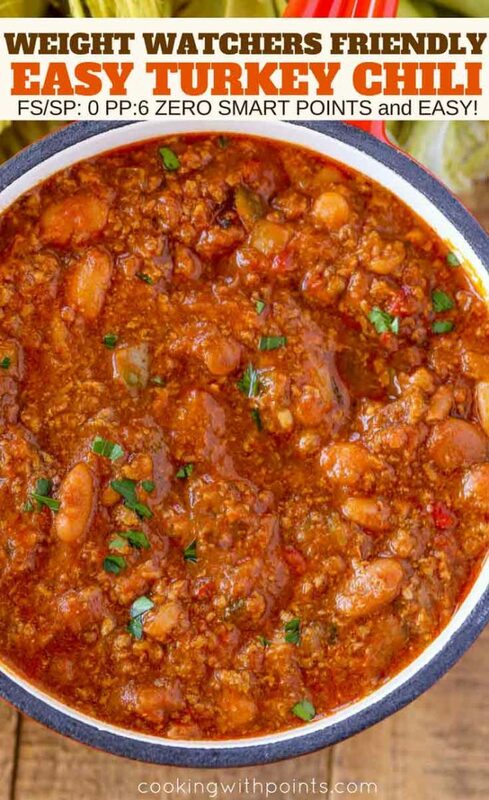 OMG this turkey chili looks amazing!! Thanks, Allyson! I hope you enjoy it! There isn’t much better than a big bowl of chili! 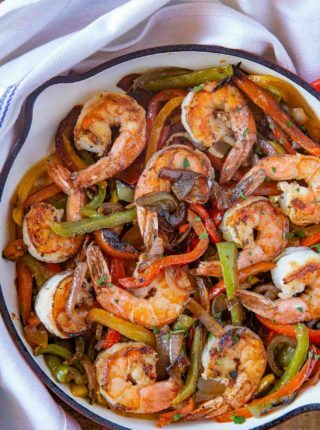 I love that this is such a healthy dish! I LOVE this chili!! It’s full of amazing flavors! 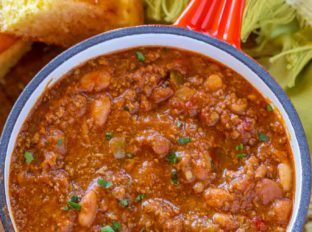 Love easy and love turkey chili! I will have to make! I made this tonight and it is an excellent tasting chili and made it exactly as written. In fact, it is my favorite one that I have tried so far and I have tried a lot of them. This is a keeper recipe and one that I will make again and again. Thank you! I love your website too ! Thank you so much Barbara! I really appreciate getting messages like these from fans! So glad you’re enjoying my recipes! Oooh I LOVE the flavors in this! Can’t wait to make it! Hope you enjoy it, Cathy! I made this recently and it is the best homemade chili I have found. The spices were perfect. My husband loved it also. Since it is 0 SP I was able to top it with sour cream, cheese, and olives. 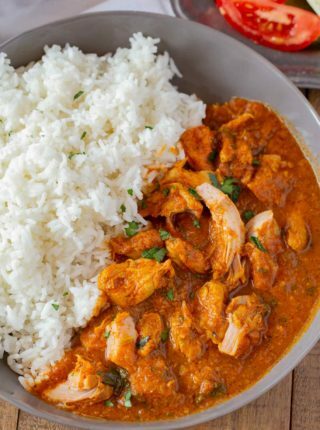 I really love your recipes, this website has become my favorite for weight watchers. Thank you! Janealma, I’m so glad my site has become a resource for you! Thank you! Not sure what the discrepancy is, different calculators use different values for ingredients.